Whatever the motivation for comparison, at Ranger, we're committed to setting the pace for everything else on the water. 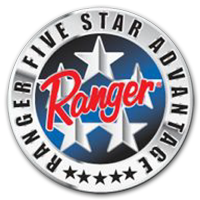 Nowhere are the differences more evident and the commitment more clear than with our exclusive Five Star Advantage. As you'll see in the five points below, this comprehensive set of advantages not only assure you of the highest commitment to Quality, Performance, and Innovation, but they also reflect our dedication to the strongest possible Resale Values and your continued Peace Of Mind. What boat do you currently own? Do you have a dealer preference? Welcome to the All-Time Richest Tournament Payouts! There is nothing else like it.